The teeth also confirmed that Hitler was a vegetarian. 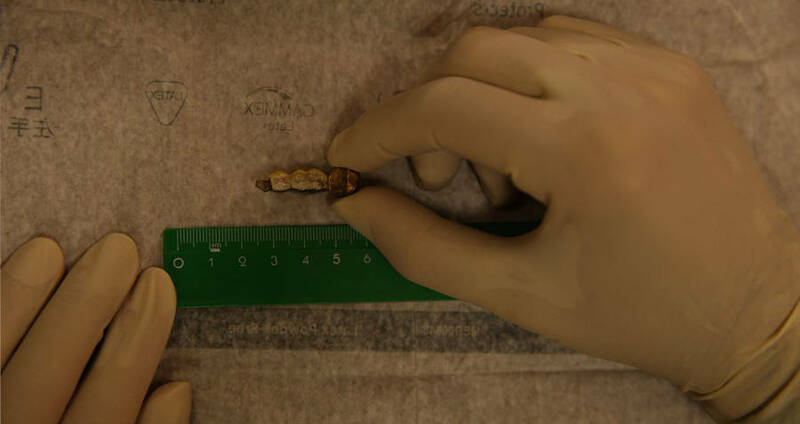 TwitterThe four teeth of Hitler’s that were analyzed. Ever since the Fuhrer allagedly perished by his own hand, conspiracy theories have abounded. From believing that Adolf Hitler is alive and well in Argentina to believing that he escaped to the dark side of the moon, it seems more people believed that he was alive than that he was dead. However, a new study claims it will shut down those rumors for good. According to the study, published in the European Journal of Internal Medicine, the teeth are definitely Hitler’s – and definitely worse for wear. “The teeth are authentic, there is no possible doubt. Our study proves that Hitler died in 1945,” professor Philippe Charlier told AFP news agency. “We can stop all the conspiracy theories about Hitler. He did not flee to Argentina in a submarine, he is not in a hidden base in Antarctica or on the dark side of the moon,” he added. As for how the scientists got their hands on the teeth, that’s another story. After Hitler and his wife of 12 hours Eva Braun killed themselves with cyanide, their bodies were cremated at the behest of the Fuhrer. Though most of the remains were destroyed by the fire, it appears that a small portion of the upper jaw complete with a few teeth survived. The teeth were apparently picked up by the Russian intelligence service but held in secret for decades. Only recently were scientists able to get a look at them and conduct tests. A team of international scientists used Soviet autopsy reports, radiographs from American archives, historical data and dental records to prove that the teeth were really Adolf Hitler’s. Now, they’re convinced. 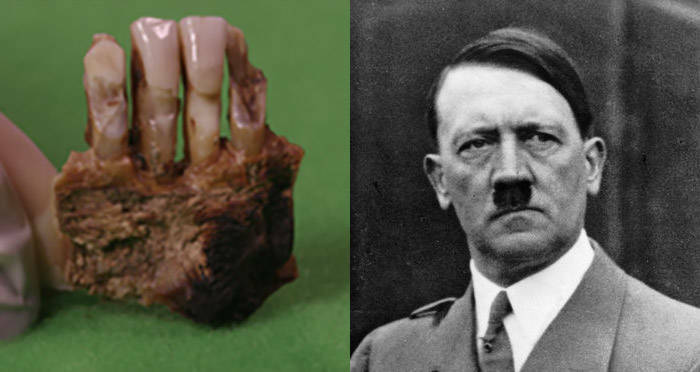 Besides indicating cause and location of death, the teeth also give a surprisingly intimate glimpse into who Hitler was as a person. Through the 73 years of wear and tear, the scientists were able to deduce that only four teeth out of Hitlers entire mouth were original and that he had quite a few false metallic teeth. He also likely had gum disease and didn’t brush nearly enough. The teeth also confirm another rumor about Hitler, though not nearly as large of one – according to reports, the wearing on the teeth indicates Hitler was a vegetarian. Next, check out these photos of Hitler that he himself had banned. Then, read about all of the Hitler death conspiracies that people believed.